Old Trafford, Manchester - Manchester United Blog: Is Jonny Evans becoming a class act? Although he can still seem fragile and error prone at times, Jonny Evans has undoubtedly moved on considerably from his nightmarish campaign of 2010/11. His stupid sending off in the Derby aside, Evans has matured nicely this term and, in the absence of Vidic, has settled impressively into his task along side Rio Ferdinand. Indeed in recent weeks Evans has delivered some eye-catchingly stylish performances as we will analyse with the aid of the tables below. 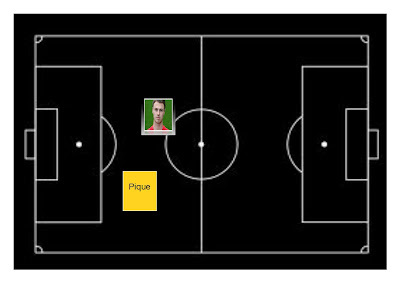 Average positions on the ball V Liverpool (h) Feb 11th 2012. 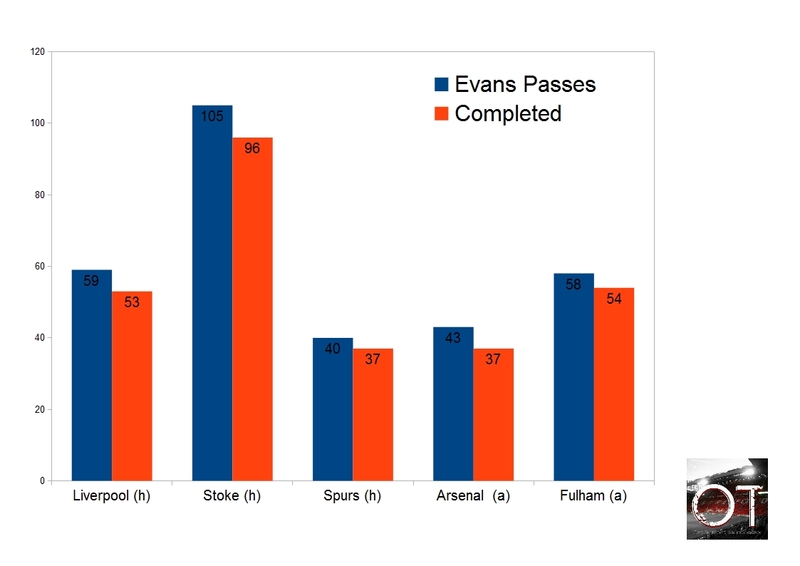 We see from the chart that Evans played in quite an advanced position against Liverpool, often carrying the ball out of defence. In fact, his average position overlaps with that of Micheal Carrick, suggesting that it was Carrick who dropped back to cover on the occasions when Evans surged forward, but also highlighting Carrick's ability to bring those around him into the game. As a result of his advanced role, Evans was heavily involved in much of United's play, making more passes than all but three other players on the pitch. The majority of Evan's passes went forward. In the first fifteen minutes he played 9 passes, 8 of which were successful. Of these, only one pass was either backwards or sideways. In the second half he made just one backward or sideways pass in the whole 45 minutes. Overall, only 7 of Evans' 59 passes were backwards. But was not the first time this season that Evans enjoyed prominence on the ball. Against Spurs back in August, the Ulsterman was was already setting the tone for his season as the table below shows. 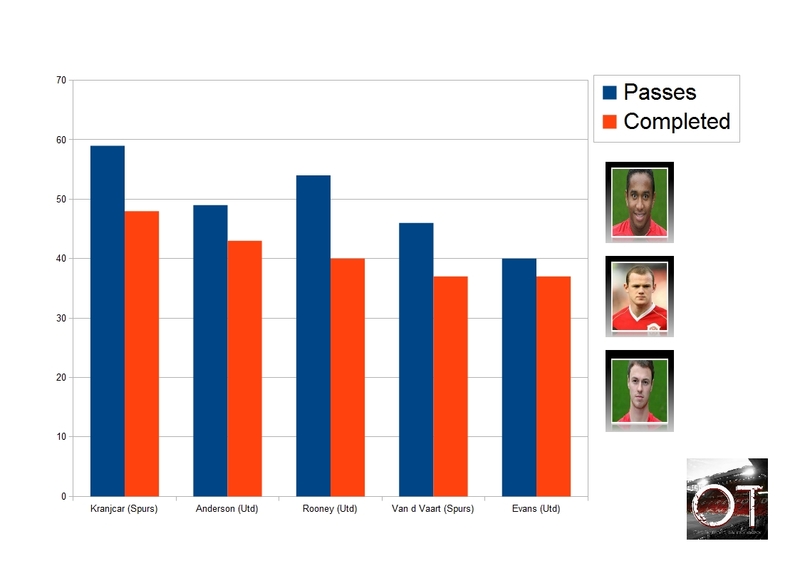 Top five passers Man Utd V Spurs 22 August 2011. Against Stoke City at Old Trafford he was magnificent on the ball, attempting over a hundred passes; only bettered by Carrick and Scholes. So who should we look to in order to form a comparison? Perhaps the best team of all, Barcelona, and their ex-red, ball playing defender Gerard Pique. We would expect Pique to be a prolific passer given his comfort on the ball, but also because of the team he plays for. Barcelona players knock the ball around to one another for fun, usually notching a very high number of passes. 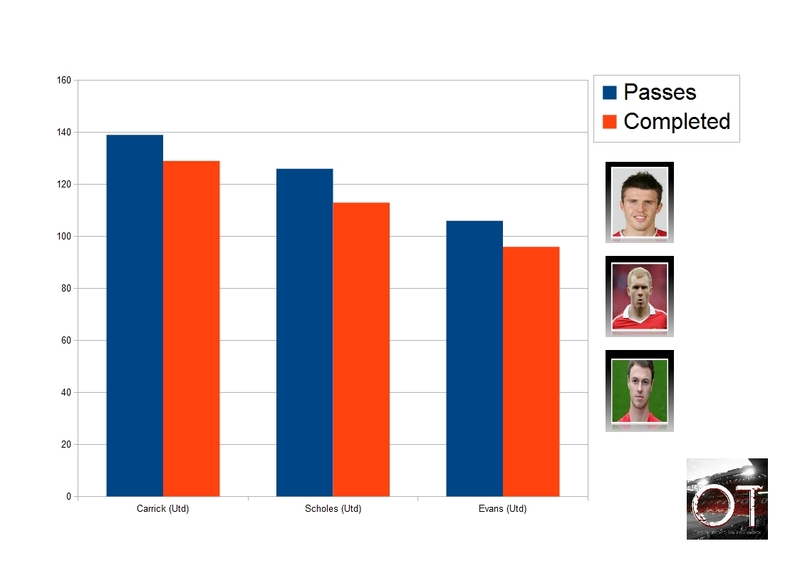 From our sample we see that Pique usually completes around 59 passes. Against Panathinaikos he was below average; against Rubin Kazan, he was exceptional in a 5-1 win. 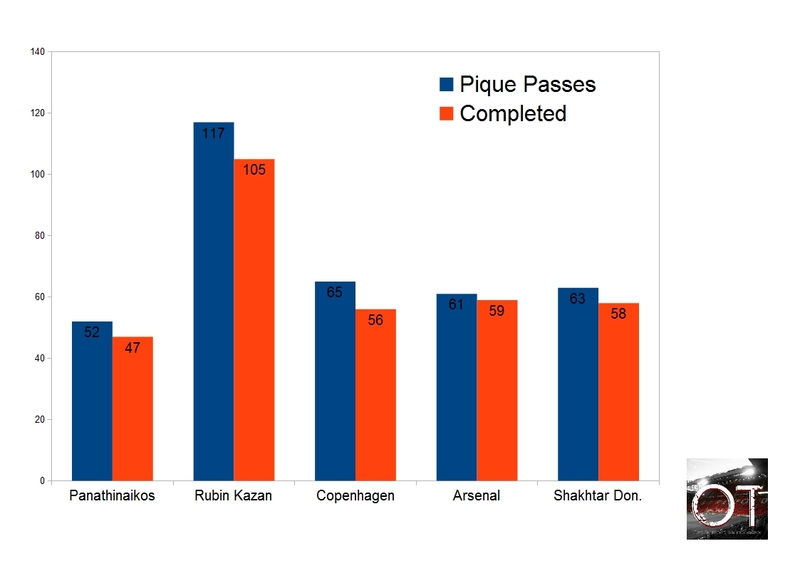 Evan's analysis suggests that he is frequently in the same range as Pique, completing over 50 passes on three of the five matches shown. It is worth noting that his poorest performances on the ball - V Spurs and V Arsenal - came in games where he was played on the left side of the defence. 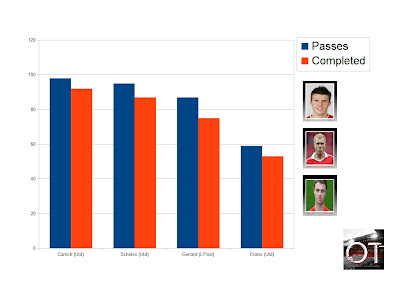 Here we compare the two players against the same opposition; Arsenal. 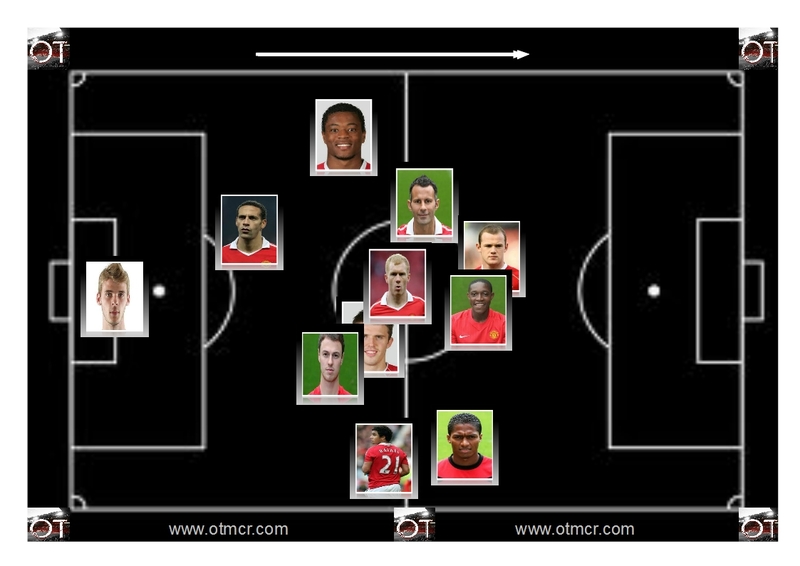 Due to Rio Ferdinand's injury, Evans switched to the left side against Arsenal, with Chris Smalling on the right. Despite this change of role, Evans maintained a more advanced position than Ferdinand usually occupies and as we see from this blackboard, he was more advanced than Pique was against the same opposition too. In fact, in all of the games we analysed, Evans held more advanced positions than Pique meaning that, in theory, the United man is receiving the ball and playing his passes in more congested areas. So from the analysis above we get a picture of a defender who is more than comfortable on the ball and likes to get involved in and around the midfield too. But it is not all good. Further analysis shows that he makes fewer clearances in comparison to other defenders. In the recent match against Chelsea for example, Evans made just 2 while his partner Ferdinand made 9. A slight weakness in his aerial game has also been detected while most reds would testify that the odd positional error from the young Ulsterman has cost a goal or two. He also seems to be less comfortable on the left side. But in spite of these criticisms, Evans had been a part of more clean sheets than any other United player this season. His willingness to help out his midfielders has contributed to the team's overall success and most promising of all, he looks to be a far more confident and mature player than he was last year. Overall, it seems that in Jonny Evans, United have a very promising, stylish and modern defender who has all of the attributes to be among the best ball playing centre backs in Europe. Lets hope he makes it.